RURU (owl who represents life and death). Housed Taonga (treasures) of the ancestors and was brought out on special occassions to remember love ones and child birth. 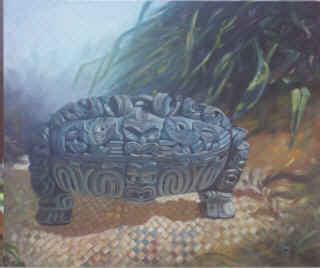 Painted 2000: oil on canvas 26" x 30"
TA Moko. 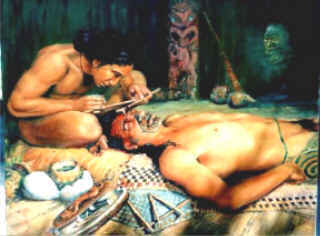 The art of Tattoo was a profession, highly ranked and skilled among Maori and followed strict protocol. This painting shows it in practice Pre European. Clothing was taboo during and up to 4 days after the Moko was done. also the person who had recieved the tattoo was not allowed to touch himself or other and would be hand fed for weeks after. this made sense for hygiene. Moko was used to Identify the Person his family and ranking. Often the whole body was tatooed and would be done over many years. Even in years gone by the Art of luring your sweet heart was always practiced. 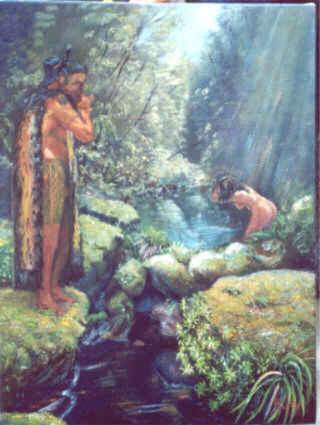 Shown here as he plays a nose flute to get his beautilful Hinemoa to marry him, with the help of the rock people.